What is often overlooked in this well known passage from the Gospel of Matthew is that it is a depiction of the judgement and subsequent grouping of peoples, “all the nations”, on how they responded to Son of Man.1 Every aspect of action and response by those among the sheep or the goats in this story is in the plural (“when did we see you”). This isn’t only about how individuals responded. In the story, the Son of Man is also assumed to be the King, who directly ties His own identity to the hungry, the thirsty, foreigners, the naked, the prisoners, and the sick. Those “nations” who provided aid and shelter to persons among these are called “righteous” and “well spoken of by My Father, and they inherit the kingdom of God (v.34). Those who did not provide aid are sent to the punishment of “eternal fire” intended for the Devil, the Diabolical One, and his messengers (v. 41). 1. [back to post] The Greek for “all the nations” is πάντα τὰ ἔθνη, panta ta ethnē. This can and is used as a generic for “all the Gentiles,” all non-Jews, corporately and individually (its cognate phrase in Hebrew would be “ha goyim“, הגוים). 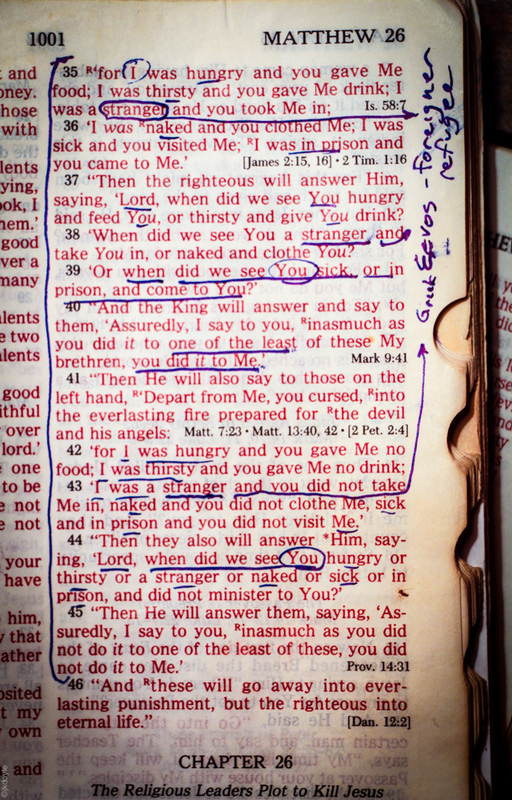 However, too often in our modern, Western (and certainly American) perspectives we tend to interpret biblical passages in in the singular, as if this story in Matthew 25, for example, is only about how I respond to people in need. What is lost is that such references as “the Gentiles”, ta ethnē, is at its core a corporate reference. What is also often overlooked is that from certain Jewish perspectives the story in Matthew 25 could be understood to be about judgement specifically for only non-Jewish nations.